We are pleased to announce that Glaro’s Signature Series Bellman Cart model #8868 with ball crown top and six wheels is currently being featured in Departures Magazine. 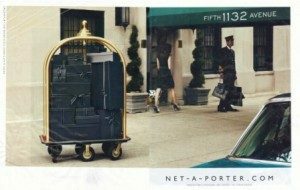 A full page ad by company Net-A-Porter.Com shows Glaro’s satin brass cart fully loaded with luggage on Fifth Avenue in Manhattan, New York ready for transport to a nearby hotel or residence. This is not the first time Glaro Inc. bellman carts have made “guest appearances” in media and entertainment. In fact, the carts have been used as props in theatrical productions, movies and television shows in the past. The feedback we have been given is that Glaro carts are easy to wheel—even with a full load—and are highly maneuverable. We attribute the cart’s reputation in the market to its sleek, classic design, and its unique functionality. The Signature Series cart in the Departures Magazine ad has “pinpoint maneuverability,” a term that Glaro Inc. conceived in the 1980’s. “Pinpoint maneuverability” is the ability of the cart to easily swivel in place 360 degrees, turn in tight areas, and move effortlessly on uneven surfaces. Because of the engineering, these carts also have a “push or pull” design, whereby they move just as easily regardless of which end of the cart the operator is located and which direction he wishes to move. Glaro Inc. is pleased to have its products selected by companies who care enough about quality to feature them in their advertising campaigns. We continue to believe that bellman carts can be both functional and attractive. For more information on bellman carts, call (631) 234-1050 or visit glaro(dot)com.